If your gas or electric range starts malfunctioning, you should contact a professional appliance repair company right away. A faulty cooking appliance can become a huge problem if not remedied at once. So, don’t hesitate and contact our company for a quick range repair in Fair Lawn. We provide effective and affordable services across the Fair Lawn region in New Jersey.Whether you need an oven range repair, cook top replacement or freestanding range cooker installation, we can help you. Whatever your needs are, we are the right people to call. Whenever your range starts giving you troubles, you can rely on our team. As we are a local service provider, you won’t have to wait long for our electric or gas range repair specialists. We are available throughout the day and ready to come out at a time that is convenient for you. Just get in touch with our experts, and we will arrive and fix your range in a jiffy. No matter, if it’s a gas or electric range repair that you require, we will handle the task in the most professional manner.Our technicians are trained to work on all types of ranges, including the high-end models.So, you can count on us to perform a glass range repair as well. 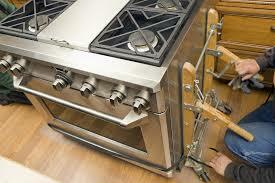 Electric or gas range installation requires proper skills and knowledge. By allowing amateurs to connect your range or stove to gas or electric lines, you are putting your safety at risk. Better leave this complex task to the professionals at Appliance Repair Fair Lawn.Backed with the years of experience, our certified technicians will quickly install your unit and make sure it works properly. Over years, we have installed hundreds of cooking appliances and can ensure the job will be done safely and accurately.Contact us today for Fair Lawn range repair and we will set things right in a timely fashion!